Shoulder impingement, commonly known as impingement syndrome or swimmer’s shoulder, can cause inflammation and pain in the shoulder. Impingement of the shoulder can occur when the tendons of the rotator cuffs grind against the shoulder bone known as the acromion. Shoulder impingement is one of the most common conditions to cause shoulder pain, discomfort, and inflammation. What parts of the shoulder are affected by shoulder impingement? The shoulder is comprised of 3 bones known as the shoulder blade (scapula), collarbone (clavicle), and the upper arm bone (humerus). The rotator cuff is made of multiple fused tendons and connects to the humerus and shoulder blade. The purpose of tendons in the body is to attach muscle to bone. The muscles can then cause the bones to move by pulling the tendons. The rotator cuff helps to elevate the arm and rotate it left or right. A bursa (lubricated sac) is designed to reduce the friction between 2 moving parts in the body. There is a bursa between the rotator cuff tendons and the shoulder blade to prevent damage from these parts of the body rubbing against one another. In a healthy shoulder, there is adequate room between the shoulder blade and the rotator cuff to allow for proper functionality and comfortable movement. The tendons of the rotator cuff should move easily under the shoulder blade when raising the arm. The tendons and bursa in your shoulder rub against one another every time you raise your arm above your head. This grinding or pinching when using the arm is known as impingement. Shoulder impingement happens to everyone, but the difference is the degree of severity to which it occurs. While everyday activities that involve raising the arm above the shoulder can lead to shoulder impingement, it does not, in most cases, cause much discomfort or pain. If you have a job or hobby that involves repetitive arm movements above shoulder level, this may cause shoulder impingement to worsen and cause pain. When shoulder impingement starts to cause damage to the rotator cuff, it is important to seek out a shoulder impingement treatment. Impingement syndrome may worsen if you have or develop bone spurs in the shoulder, which can reduce the space under the shoulder blade. This reduction in space results in more contact, friction, and shoulder impingement, which can begin to cause pain or worsen existing symptoms. Shoulder impingement symptoms include aches and pain in the shoulder. As shoulder impingement progresses, it may begin to cause pain in the shoulder when raising the arm to or above shoulder level. A symptom of impingement syndrome is also a sharp pain when attempting to move your arm behind your lower back. Joint stiffness is also a common impingement syndrome symptom. If you experience arm weakness or have trouble lifting your arm, you may have a torn rotator cuff. How can Dr. Rozbruch diagnose shoulder impingement? Dr. Rozbruch may suggest a physical examination with your internist in order to better understand your medical history and current health. He may also ask questions about what symptoms you may be feeling and if any action or position increases or reduces discomfort. Dr. Rozbruch may also ask questions pertaining to your work, everyday life, and hobbies to determine if a certain activity is causing your shoulder pain. For more information on the health of your shoulder, a shoulder X-ray or shoulder MRI may be ordered to detect the presence of any bone spurs that may be causing pain. An MRI of the shoulder may also help to determine if your rotator cuff has been damaged or torn. Rotator cuff tears can be diagnosed with an arthrogram, which involves a dye being injected into the joint of the affected shoulder. Several shoulder X-ray scans will then be taken. If the dye stays within the shoulder joint, it is safe to assume the rotator cuff is not torn. 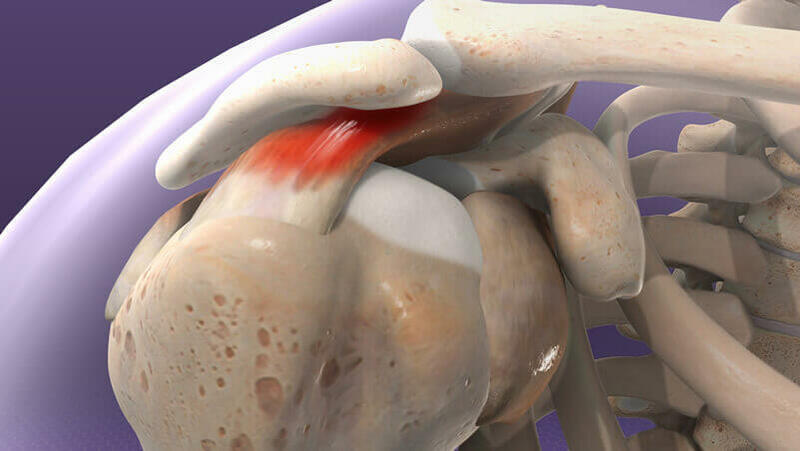 Another simple test to diagnose your symptoms is with shoulder impingement injections, which use a local anesthetic to temporarily numb your shoulder joint. If you do not experience any pain while your shoulder joint is numbed, Dr. Rozbruch can assume that your pain stems from the shoulder joint. If your pain does not go away while the local anesthetic has numbed your shoulder, Dr. Rozbruch may be able to determine if the pain is caused by a nearby condition, such as a pinched neck nerve. What nonsurgical shoulder impingement treatments are available? Unless your symptoms are severe, Dr. Rozbruch will likely attempt to treat impingement syndrome with nonsurgical techniques. For mild cases of impingement syndrome, Dr. Rozbruch may suggest anti-inflammatory medication and rest to allow the shoulder to heal. Ice packs can also help ease swelling and pain from shoulder impingement. Cortisone injections into the shoulder joint can also reduce the swelling and discomfort of shoulder impingement. While the effects of Cortisone injections for shoulder impingement are temporary, they can provide dramatic results for several months. Physical therapy is also an effective nonsurgical shoulder impingement treatment that can help regain shoulder functionality and mobility. Physical therapy for impingement syndrome can last 4-6 weeks and can help strengthen the shoulder muscles to reduce symptoms. What shoulder impingement surgeries are available? Shoulder impingement surgery is reserved for patients with extreme pain or a severe case of impingement syndrome. If your shoulder impingement symptoms do not respond to a nonsurgical treatment, Dr. Rozbruch may suggest impingement syndrome surgery. There are several techniques of impingement surgery. Some of the most popular shoulder impingement surgeries include open shoulder impingement surgery, shoulder resection arthroplasty, acromioplasty, and arthroscopic shoulder impingement surgery. During open shoulder impingement surgery, an incision is made where bone can be removed from. These incisions are typically placed over the top of the shoulder. Open shoulder impingement surgery removes any existing bone spurs from the shoulder, as well as part of the acromion. The rough ends of the bone will then be gently smoothed. With open shoulder impingement surgery, patients may be required to stay in the hospital for a few days following surgery. Along with shoulder impingement, the AC joint may become damaged due to arthritis. To treat AC joint arthritis, Dr. Rozbruch will remove the end of the shoulder during shoulder impingement surgery. This procedure is known as shoulder resection arthroplasty, which involves removing the last inch of the shoulder bone. Following impingement syndrome surgery, scar tissue will form in the space between the shoulder blade and acromion, which creates a joint-like structure. Shoulder resection arthroplasty is designed to minimize bone-to-bone contact to reduce pain. Acromioplasty aims to increase the overall space between the tendons of the rotator cuff and the acromion. Because acromioplasty alleviates pressure from the tissues below the acromion, it is also referred to as subacromial decompression surgery. During acromioplasty, Dr. Rozbruch will remove bone spurs that are disturbing or damaging the bursa or rotator cuff. A portion of the shoulder blade may also be removed during acromioplasty to provide more space for the tendons. If your shoulder blade is naturally tilted downward, additional portions of the shoulder blade may need to be removed. The term acromioplasty comes from the surgical cutting and reshaping of the shoulder blade during subacromial decompression surgery. Some cases of impingement syndrome can be treated with minimally invasive arthroscopic shoulder impingement surgery. An arthroscope is a tiny camera at the end of an endoscope that can provide an internal view of the body. The images gained from the endoscope can be displayed on a screen, allowing Dr. Rozbruch a live view of the shoulder joint. The arthroscope is placed through a small incision. Additional small incisions will be made to insert surgical instruments to perform the shoulder impingement surgery. Patients who undergo arthroscopic shoulder impingement surgery generally recover more quickly because it is a less invasive procedure. How long does it take to recover from a shoulder impingement treatment or surgery? Following a nonsurgical shoulder impingement treatment, Dr. Rozbruch may prescribe physical therapy to strengthen the shoulder. Physical therapy can help stretch and strengthen the tendons, rotator cuff, and shoulder to reduce friction and ease painful impingement symptoms. By increasing the strength of the muscles around the rotator cuff, you can help stabilize your shoulder joint and reduce shoulder impingement. If you have undergone shoulder impingement surgery, physical therapy sessions may be delayed several weeks as your incisions and shoulder heal. Full recovery from impingement syndrome surgery may take several months but depends on what shoulder impingement surgery you underwent and the severity of your impingement syndrome symptoms. A protective sling will help to reduce motion and pain in the shoulder immediately following shoulder impingement surgery. After a few days, you may begin light physical therapy. When you start physical therapy sessions will be decided by Dr. Rozbruch and depend on your rate of healing and pain level. If you underwent arthroscopic shoulder impingement surgery, you may heal and progress with physical therapy more quickly. For patients who have undergone open shoulder impingement surgery, the rate of healing and progress may be slower. Physical therapy often does not start for a couple of weeks following open shoulder impingement surgery. The first exercises that are introduced are often passive movements where your shoulder joint is moved while your muscles are relaxed. These types of exercises may be performed by your physical therapist, as he or she will gently move your arm during passive exercises. Physical therapy will begin to progress and incorporate strength training 6 weeks after shoulder impingement surgery. These exercises are designed to improve the overall strength and control you have over the rotator cuff and muscles of the shoulder. Towards the end of your physical therapy sessions, your physical therapist may teach you how to properly partake in activities without injuring your shoulder and at-home exercises. How can I learn more about shoulder impingement? To learn more about shoulder impingement, please request an appointment online or call Dr. Rozbruch’s orthopedic office in NYC at 212-744-9857. Prior to an office visit, please fill out Dr. Rozbruch’s patient forms to expedite your first visit.